This example will show how to configure VLANs on a Ubiquiti Tough Switch using a MikroTik Router. On the MikroTik Router ether1 is configured as the gateway whilst ether5 is a trunk port with three vlans (1, 5 and 6). The Ubiquiti Tough Switch is configured with ether1 as a trunk port. ether2 is configured with vlan-id 5 and ether3 with vlan-id 6. 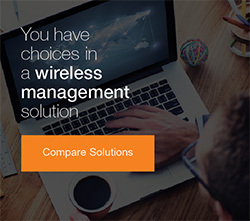 Create VLANs 5 and 6 on the Ubiquiti Tough Switch. Tag vlan1, vlan5 and vlan6 traffic. Untag Port 2 traffic. This will untag/strip Port 2 ingress traffic of any vlan-id (traffic destined out Port 2 to the local lan). All egress traffic will be tagged with vlan-id 5 (traffic originating from port 2 destined for another network). 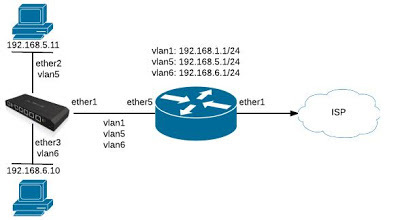 Exclude vlan1 and vlan6 traffic. Untag Port 3 traffic. This will untag/strip Port 3 ingress traffic of any vlan-id (traffic destined out Port 3 to the local lan). All egress traffic will be tagged with vlan-id 6 (traffic originating from port 3 destined for another network). 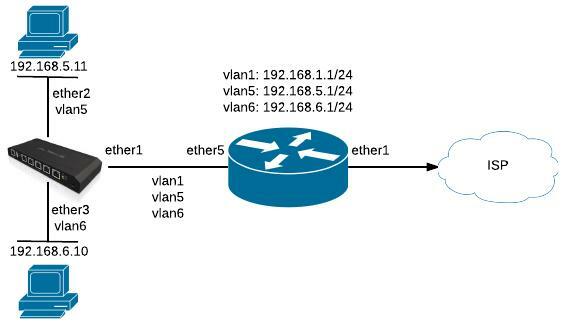 Exclude vlan1 and vlan5 traffic. hi, thanks for the tutorial. in my network, port 2 and port 3 connected to airgrids. when i connect from port 2, i cannot see my airgrids on port 3. is there anything i can do so i can see my airgrid on the other network? Hi, are you able to ping the other way from port 3 to port 2 or can you not see either way? i can't see either way. what can i do to ping my airgrid on the other port?